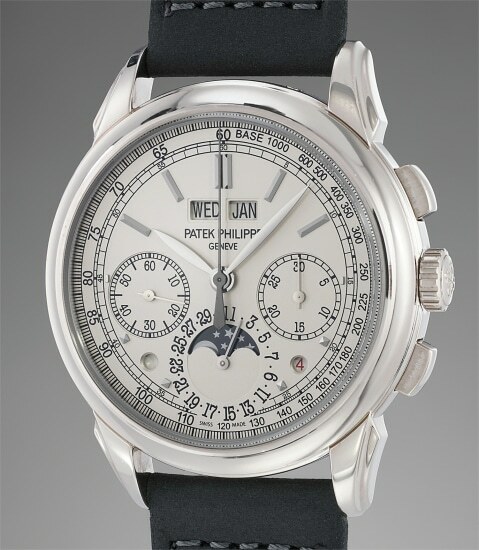 Accessories: Accompanied by Patek Philippe Certificate of Origin dated December 12, 2012 and stamped Wempe, additional caseback, setting pin, instruction manual, product literature and fitted presentation box. First series: The hands and numerals are black, offering the highest legibility among all the three series. Most notably, it lacks a tachymeter scale. Second series: The hand and numerals are now a more classic silvered finish and the tachymeter scale has been added. The scale follows the contour of the subsidiary seconds counter creating what is now known as "The Chin". Third series: The final iteration features unchanged silvered numerals and hands, however the tachymeter scale now stops where it intersects the outer date ring. Sold at the storied retailer Wempe and offered in excellent condition, this third series 5270 has hardly been worn throughout its lifetime and is offered with its original accessories such as its original certificate, numbered additional case back, setting pin and fitted presentation box.